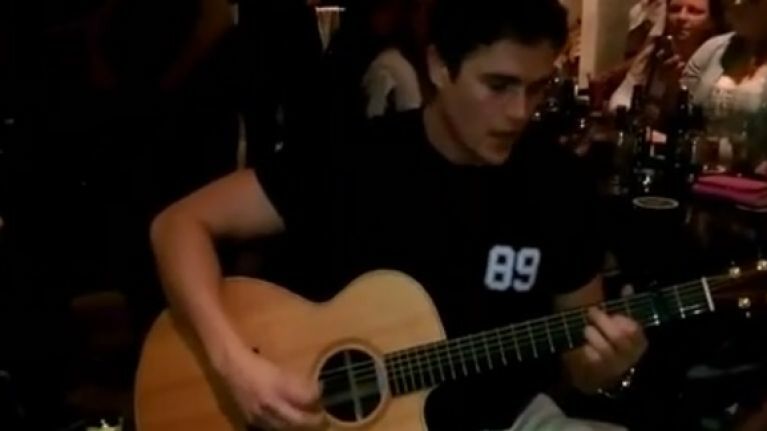 Home and Away fans were in for a treat recently when Nic Westaway, AKA Kyle Braxton, got involved in a sing-along in the Milltown Inn, just outside Newbridge, last Tuesday and it wasn't the Home and Away theme music being played. The young actor, better known for playing bad boy Kyle Braxton in the Aussie soap Home and Away, got a chance to show off his musical talents, 'bating' out a trad tune with a borrowed guitar. Kyle, belting out an old song with some of our owns finest . . The Aussie is seen getting into the swing of things in a crowded pub just outside Newbridge, where he also visited Newbridge Silverware and The Silver Restaurant. Clearly familiar with the acoustic instrument, Nic played a full song to a rapturous audience and got a massive round of applause when he finished up.